While the GPS is an extremely efficient tool in helping us get to where we are going, a good old paper map allows us to see the big picture. This is true in business as well. If we only rely on the technology and management tools, we’ll stay focused on the “blue line” rather than looking at the bigger opportunities that might be out there. 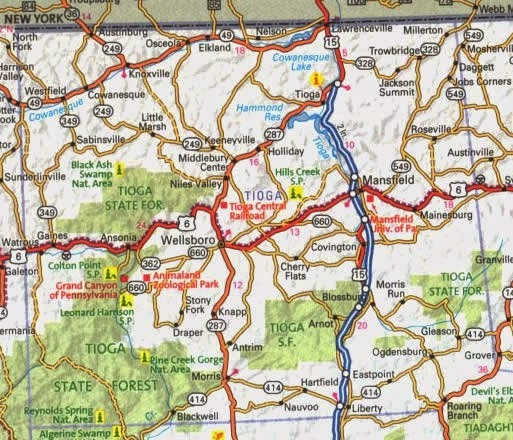 On our driving trip across the country I have found myself in places I have never driven through – eastern Ohio, upstate New York and western Massachusetts. In these situations, I have found that Google Maps on my phone is an invaluable tool. No more squinting at a map, trying to understand if I should take I-77 or Ohio 8 to get to Canton (FYI: we are on the Russell family Hall of Fame tour – pro football in Canton, basketball in Springfield, MA, the Patriots HOF for Ben in Foxboro, and the Baseball HOF in Cooperstown). But there are situations where I have questioned the information I am getting from my phone. "Wow, that doesn't seem like the easiest way to get there. Are we taking side roads where we will get stuck in traffic or interstates?" I know that the GPS will, in fact, get me to my destination, but I am unclear on the big picture of where I am going. All I know is that if I turn left or right and stay on the blue line things will all be good. Or will they? Throughout the trip, Lisa and I have found ourselves conferring with both Apple Maps and Google Maps - plugging addresses into multiple phones - and they sometimes provide different answers. And because I am a just a bit old school, I bought a good old Road Atlas at the I-80 truck stop early in our journey. After the 22 hours we spent in the car this week, I have spent some time thinking about the difference between the GPS on my smartphone and the paper map. I think the distinction between the two tools have applicability in the rest of our lives as well. The GPS has incredible smarts built into it. It knows the traffic on various roads and can route you around traffic jams. It will sometimes let you know alternate ways that may be faster (or slower). It reads the directions to you so you can keep your eyes on the road. In many ways, the GPS is superior to the paper map that you have to decipher, refer to as you drive and provides no additional data. Except the paper map is superior in one way – it lets you easily see the big picture. You can see one state, multiple states, even the entire country at a glance. You can follow a road all the way to the destination easily. Sure the phone has that capability if you keep swiping out far enough, but that isn't the strength of a GPS. In some ways managing our businesses can be like the GPS – we have metrics and dashboards, tools and techniques. But if we don’t have a map, it is easy to lose sight of the big picture. Just stay on the blue line. Don’t worry about the rest – someone else is looking at that, right? I believe that an essential part of leadership is backing all the way up and seeing the biggest picture possible. Not that it is always clear, because it isn't. But thinking about the journey – which way will be the best, which way can we navigate the easiest, even what is our preference – is something leaders need to do on a regular basis. I noticed that sometimes Google Maps will put me on an obscure route because it is one minute faster, even though it may mean a smaller road. In one situation, Apple Maps took me a back route to a restaurant and Google wanted me to take the main road. In another situation, I Googled a restaurant and it sent me to a location 10 minutes away rather than the one I had just passed. Without knowing where I was going, I followed the map, only to realize that I had arrived at precisely the wrong place. The GPS has no judgment beyond what is programmed - when we stopped for gas, it thought we took a wrong turn rather than just a temporary stop on the journey to our destination. The ability to see this broader context is what maps, and our own judgment, allow us to do better than the GPS. In business, it is what leaders must do. Focus on the context and explain the way forward. Technology and management tools can make sure we get there in the fastest, most efficient way. But in business, like in navigation, only our judgment can make the decision about the best course for us. It isn't always easy with either tool. Sometimes you find yourself at a fork in the road and needing to make a decision – left or right. A combination of the tools is helpful. The map can let you see many miles down the road in a quick glance – where is the road taking us? The GPS knows the route you originally set and can reroute you if you took a wrong turn. Sometimes I found myself overriding the GPS because I could see another way might be better – we might drive by something interesting, we might have to take fewer turns or maybe there was a rest stop that was desperately needed. I was talking with someone awhile back about the wonders of Google Maps and mentioned that our kids will never be lost. Plug an address into the phone and follow the blue line. Don't worry about the roads and the way, because you can just follow the blue line. In someways, I think that is a shame – while I hate being lost, some of the most interesting things happen while you are lost. And importantly, you learn what caused you to be lost – what mistake you made and hopefully how not to make the same mistake again. It also concerns me that our children might learn to just follow the blue line – suspending their own logic and judgment. In business, we need team members at all levels that want to look at the map. It is important to know that on a day-to-day basis, we generally are following the blue line (the course we have plotted out). I believe alignment is critical in an organization (do we all know where we are going – is it New York or California?). We need to know the best way to get there, but we also need people who are continually looking at the map and suggesting that if we took a slightly different road that we might find a new opportunity, get there a bit faster or enjoy the ride a bit more. That doesn't happen if all we do is follow the blue line blindly. Make sure you are taking a look at the map frequently. Are you still headed where you thought you were? Is it still the place you want to go? Use the tools and technology to go where you want, not allow the tools to drive where you are headed. Chart your own path – often a few small deviations will make the trip that much better. This is my blog about leadership and adaptability. This is my blog about leadership and adaptability. My day job is as a leader in the insurance industry as the President and CEO of Delta Dental of Iowa. I used to be in the financial services industry, serving as the President and CEO of TMG Financial Services, an agent-issuing credit card company, as well as Senior Advisor to The Members Group, a payments and card processing company serving community financial institutions. The comments here are based on my experience in fast-growing companies and a bit of my philosophy. I hang out with a number of really bright people and try and learn something in the process. Disclaimer: The thoughts and comments here are solely mine (good, bad or indifferent) and do not represent the company I help to lead. This is my place to express my thoughts on leadership and growing companies.